In 2017 I decided to design a calendar. Intended for personal use only, as I wasn’t particularly happy with the designs available online (at least the ones that I could find). I printed a batch of these on A5 and gave out a few to friends, however it was my wife who showed me how this design should be used. 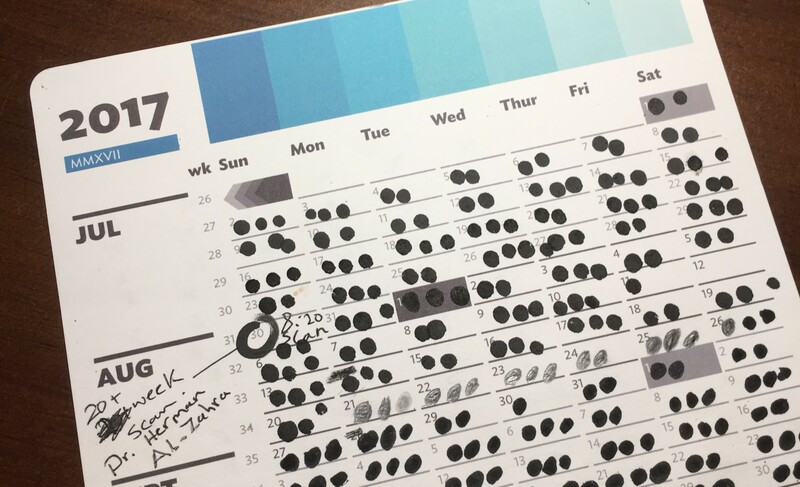 She used it to track how many of her prenatal (and then natal) pills she was taking. Each dot represented a pill taken. When 2018 rolled around, she was the only person pestering me for the new one, so I know someone needed this. Maybe others do as well? This is my third attempt at the Calendar. It’s an actions tracking calendar. I want to do this thing multiple times a year. Creating a habit. Recording progress. Print it out or use it on your iPad. There is space at the very top to write what it is you’re tracking this year. Use multiple calendars to track a couple of things. Put a big glorious ‘x’ right in the middle of that square. Enjoy that ‘x’ then come again tomorrow for some more. The whole year lays ahead of you. Every year I seem to tweak the design every so slightly. This year is no different. I’ve decided to include these 6 seasonal references in the 2019 design. As I’ve included something whimsical above, I thought I’d counter it with something scientific as well. There are four subtle markings to remind you of where we are relative to the sun. September Equinox - End of summer or winter (depending on hemisphere).